GUNNING™ is a group exercise with GUN-eX® COBRA elastic ropes. Recommended group size is 10 – 20 people. Benefits of training with GUN-eX ropes are: high energy expenditure, muscle toning & pumping, developing speed, acceleration, strength, and power. GUNNING™ is the perfect turnkey solution for group classes in your fitness club. GUNNING is high intensity interval training that is both very demanding and very entertaining. Clients have fun and want to come back. We know this because they repeatedly told us. Short effective training, sessions are just 35 minutes long. Training in pairs = more engaging and more fun exercise, resulting in very high level of trainee satisfaction. Hard workout is a hard fun now. Color coded training, each color represents different type of training and difficulty level. HIIT based on athletic principles. Full body training (sprints, battling, lower body exercises, …). Complete training plan ready to be easily implemented into any fitness club schedule. Easy for client to understand and for trainer to use – each fitness level has a recommended monthly plan (amount of different colored lessons). Praised by clients for its fun factor and workout effectiveness. Valued by fitness chains for its ease of implementation and education for trainers. Sample trainings ready for every color zone. Easy to create new training and use it in a class. Interval timer is also implemented. Contains pictures of execution of movements. 5 color coded trainings with different intensity. Basic recommended movements and timing. Recommended monthly plan for different fitness levels of clients. Contains GUNNING™ intro class and its specifications. Recommended mobility warm up and cool down exercises mentioned on the poster. Kit especially designed for GUNNING™ group classes. It contains everything you need for 2 people training together in pair. In usual training situation, one person anchors the ropes and rests while person on the other end performs an exercise. Then they switch their roles. This is a very effective way how to perform high intensity interval training with a group of clients where “resting” half is still actively engaged and working. An easy way to start group training classes in your fitness club. 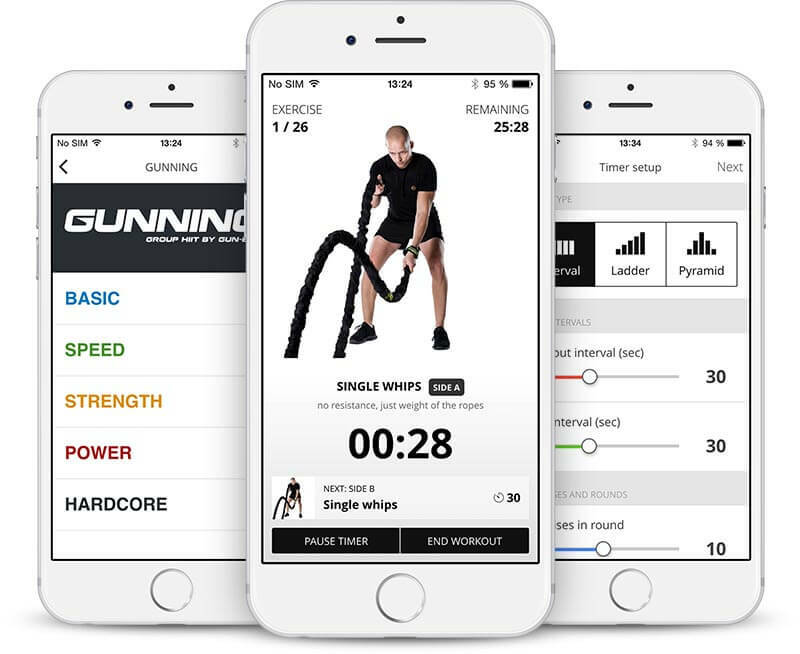 Please, contact us for price and to get more information about what GUNNING™ Group Training can do for you and how to launch it in your gym. Turnkey solution for everyone serious about group training. We help you with everything – we supply training tools, educate your trainers, launch GUNNING™ in your gym with introductory session. Creator of GUN-eX® Training System, expert educator and trainer. GUNNING is fun and your client will love it. GUNNING class with 80 attendees.